AMD's Zen 2/Pinnacle Ridge architecture is rumoured to be arriving in early 2018, with plans to improve upon Zen's already competitive design. 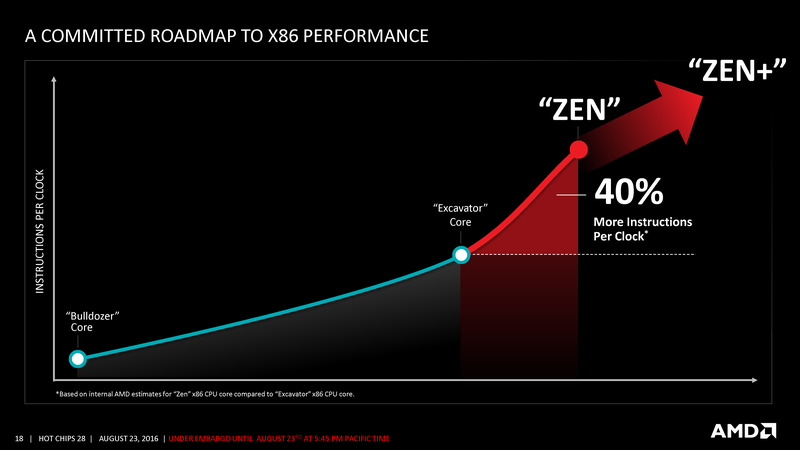 Read more on AMD's Zen+ plans. I'd rather they gave it better overclocking TBH. If Ryzen could hit a minimum 4.5Ghz on air then it's shortcomings against the 7700K in gaming would be pretty much wiped out. Ryzen sales would surge if they just sorted out it's gaming performance, especially for the upcoming R5 release, which are the real competitors to the 7600K & 7700K. IPC's are good. It's the clock speeds and software that seems to need improving. TBH higher IPC and higher clock speeds solve the same problem, getting more instructions out of the CPU per unit time. I don't care what way they go about it, just that they have a decent improvement in performance. Yes, but overclocking is fun and helps sell CPU's. People are screaming about Kaby Lake despite it being the same as Skylake because it offers higher overclocks. Well the way zen is designed it doesnt really need to get higher ghz, there are ways and means around high clock speeds, how cache is used, how memory relates to it which seems like quite a big factor in the limited testing of ryzen due to bios being dodgy at best. I mean remember the schedular in windows isnt even working yet, nothing is optomised, the voltage software isnt in ryzen yet either so its just running at default so of all the benchmarks we have seen is ryzen at its worst it shall ever be and intel at the best it has ever been and watching the benchmarks, things like the 7700k they are in the 90% usage, when you look at zen it floats at 30-50% usage. I mean remember the intels we have right now are refined upon refined upon refined. At most they can squeese maybe 3-5% real gains out of it performance wise where ryzen the only way is up. And the next time intel bring out brand spanking new stuff it will face the same probs ryzen did, maybe worse because just remember how x99 was. That had problems in silicon that couldnt even be fixed with software, and they wernt rushed with x99. One of the things they could improve upon is there Cache latency. It is slower compared to Intels. Possibly better thermals and better yields on a more mature process will help with OC'ing. Well, speeds that were reported on were from when aida was reading it wrong,but in a twist aswell dont treat ryzen cache like intel cache, ryzen uses l3 as victim cache and uses predictive branching to make it faster.